Advanced Installer fully supports AutoPlay and Default Command on any operating system starting from Windows XP up to Windows 10. 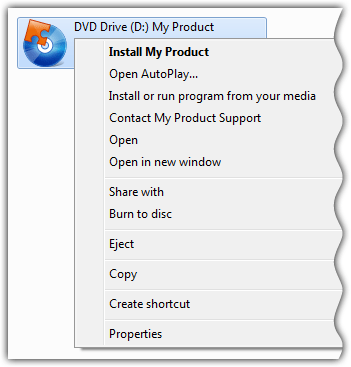 When using AutoRun for multi-language packages it's recommended to localize the CD/DVD's context menu commands as well. This can be easily done by using Advanced Installer's built-in localization support which enables you to fully localize AutoRun commands in just a couple of minutes. Advanced Installer has the ability to digitally sign the installation package after building the project. When using this feature, a digitally signed AutoRun launcher will be created as well alongside the installation package. This feature is available starting with the Enterprise Suite. See more features.